Professor of New Testament Studies Jack Levison's Lectio on Acts begins March 25, 2013. Listen to the podcasts at spu.edu/lectio. 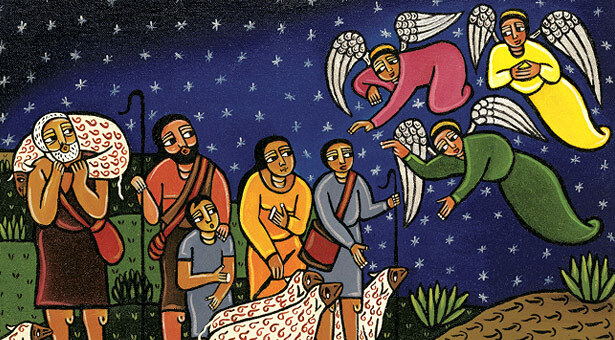 Laura James, “The Annunciation to the Shepherds,” Acrylic on Canvas, 14 ̋ × 18 ̋, 2000. Private Collection / The Bridgeman Art Collection. in preparation for writing the Lectio: Guided Bible Reading for Winter Quarter. I found that covering Luke's Gospel in 11 chapters of 2,500 words each was a major challenge. But I also found myself involved in more than a writing assignment as I opened up this remarkable story of Jesus according to Luke. While I tried to make some of the important scholarship on this gospel accessible, my main motivation was pastoral. I tried to make Luke's portrait of Jesus accessible to a contemporary college freshman. observes, Luke “was an educated and cultured man, the first real historian to write about Jesus. Luke continues his story into this Gospel's sequel, the Acts of the Apostles. Luke depicts Jesus in his short-lived ministry as deeply compassionate — caring for the poor, the oppressed, and the marginalized of that culture, such as Samaritans, Gentiles, and women. Whereas Matthew traces Jesus' genealogy to Abraham, father of the Jewish people, Luke goes back to Adam, parent of us all. Again and again, Luke zeros in on women, who were seen as second-class citizens in the first century. The first birth announcement for Jesus, as Luke tells it, was made to shepherds “living in the fields,” and were among the lowest in that society's pecking order. Jesus' ministry was for all, especially for those who were rejected or diminished in value by their society. to how often these themes appear in this Gospel. (16:19–31), The Persistent Widow (18:1–8), and The Pharisee and the Tax Collector (18:9–14). (9:51–18:14). While on his extended journey to Jerusalem, Jesus heals, teaches, and disciples his followers. Then, the book climaxes on the road to Emmaus (24:13–35). Luke's Jesus is on a journey with us. celebrate this wonderful story of Jesus according to Luke.